"The Italian Lake District" has been added to our vocabulary since we began cyclotouring abroad in 2001 and this was our third visit, taking in yet another of the major lakes, Lago Maggiore. The 40 mile long lake is about an hour's bus or train ride north from Milan and is at the base of the Alps in northwestern Italy. Like when visiting its neighbors, Lake Como and Lake Iseo, being in the district is a conflicted experience. The sight of the snow capped and dusted Alps is titillating as we anticipate strenuous climbs that will deliver stunning panoramas in the weeks ahead. But the sight of the yellow curtain of smog from the industry in the Po Valley that often hangs over the beautiful lakes fills us with disgust and resentment. We flip-flop dozens of times a day: "Ah, isn't it wonderful. Yuck! Isn't it awful." Our guide book warned that Maggiore was less spectacular than the other steeper banked lakes but failed to mention its plus side, which is that it is the biker's lake. "Never again" was our cry after biking around dramatic Lake Como as we discovered that its narrow road was a major truck route. There it was hard to take in the beauty due to the heavy focus on surviving. In contrast, Lago Maggiore is looped by what Map Man is always looking for: "a road to nowhere." Those are the little roads that have nearby big brothers that are far more efficient for vehicles traveling between significant towns and cities. At Lago Maggiore, the cyclists were out in packs and the motorists patiently waited their turn to pass the bikes instead of ignoring our presence. Stresa (stray'-zah) is the main town on the lake and Bill picked it as a staging point for visiting with our friend Mulvey Johnson as he took a detour on his trip back to Portland after a month in Pakistan and India. Mulvey dropped in for a visit with us in Gorme, Turkey a few years back on another trip to the subcontinent and we were all looking forward to the overseas reunion. Mulvey was also being a courier in bringing with him 4 lbs of pre-packed, mid-year supplies for us from the States. Monte Rosa on the way to Macugnaga. Coordinating a rendezvous is always a challenge and as our joint plans unfolded, we finally had to select a date and place to all aim for. For both get-togethers Bill looked for a place touristy enough to offer bike rentals for Mulvey and enough to do in the area once we all got there. We arrived in Stresa almost a week before Mulvey and lined up affordable lodging in this town of gracious 4 and 5 star hotels--hotels that are still expensive in low season (unlike Andorra). Then we took off for a 3 night loop into Switzerland and for a closer look at Monte Rosa from the Italian side. Map Man's plan rolled out like that of a long-time tour guide as we enjoyed lightly traveled back roads and grand views. Our 1 night in the Swiss city of Locarno on Lago Maggiore convinced us to keep our upcoming visit to Switzerland brief. Bill was able to negotiate down the $115 room to about $85--a room reminiscent of a youth hostel and with a toilet down the hall. Both the hostel look and the shared toilet are fine, it's just that we'd like to pay about half or less for that standard of accommodation. Even the bread and water we bought the next morning were double what we'd pay across the border in Italy. Of course, the weak dollar really makes it sting but Switzerland is always expensive. An unexpected stop on the way back to Stresa was at the Casa della Resistanza. We had seen many memorial stones to the WWII resistance fighters and Bill had recalled that the resistance was especially strong in northern Italy, so we screeched to a halt and looped back onto their porch. The free museum was only open to school groups at that hour but the hostess invited us in after we pressed our noses to the glass. It was odd to realize that the purpose-built granite building housed only photocopies of newspaper clippings about Mussolini's rise to power and WWII, and seating for showing the kids a video. We did our best to fill in what Bill knew about the story by deciphering bits and pieces of the many news articles and reading the small brochure in English. Italy's complicated position in WWII never stuck in my mind and I was pleased to realize that this little museum with its story about the resistance fighters had opened the door for me as now I wanted to learn more about Mussolini's rise to power. Picnicking above the gondola at a prime view point. Once back at Stresa for a longer stay we began to appreciate what a good base it is for several unusual trips. Stresa itself is a small, gracious resort town of 5,000 people with beautiful landscaped promenades along Lago Maggiore. The waterfront bustles with bus loads of tourists boarding boats for trips around the lake or to the nearby small islands. And its tiny commercial core is just minutes away by foot. The train station is an easy walk to town and being on a main line means you can hop a train to nearby towns every hour or catch a through train to Geneva, Switzerland or Venice. Stresa boasts a 2-staged gondola "Funivia" ride up its steep hillsides to almost the 6400' level. The gondola station is about a 15 minute walk along the lake promenade from the center of town. The 3 of us took our bikes to the top in the gondola and rode down. Part way down, we bailed out on the mountain bike route and headed back to the asphalt for an easy, scenic ride. The young man who rented us Mulvey's bike assured us that he took kids on the mountain bike route but it was rougher with broken rock on the trail than we wanted to do. If I were doing it again, I wouldn't bother with the bikes and would instead ride the gondola roundtrip, though still allowing time for a picnic or restaurant lunch and to admire the 360 degree views on foot. Another day trip option out of Stresa is a 12 hour day bus trip to Zermatt over the 6500' Simplon Pass to see the Matterhorn, with a 6 hour layover in the Swiss town for sightseeing on your own for $80. Though this costs a bit more than taking the train from the Swiss town of Brig, it does give you the benefit of startlingly cheaper lodging and food prices in Stresa than are available in Switzerland while still allowing time for 1 of the 3 excursions higher up the mountain. 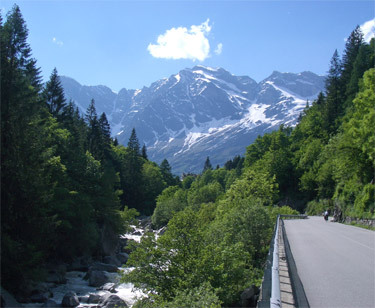 This organized bus trip and the local commuter bus are both great ways to see the stunning Simplon Pass on a clear day. In contrast, the train goes through a 12 mile long tunnel, bypassing the high drama of the pass. The tour bus stops at the top of the pass for breakfast so there is time to take it all in. After parting company with Mulvey, we took our bikes on a similar route over Simplon Pass to Brig, Switzerland to see the Matterhorn. Sucking the water bag dry on that very hot day. There is another popular outing from Stresa that combines a 3 hour boat trip north to Locarno, Switzerland covering a bit more than half the length of Lago Maggiore. After the boat ride, you transfer to a scenic rail line that travels due west to Domodossola, Italy, where you hop on a second train to return southeast to Stresa. It's all set up as a day outing though we did the same route in 3 days by bike (on the roads, no waterwings) and it was a delightful tour. The longer we stayed in Stresa, the more we appreciated what a great base it was for an extended holiday in northern Italy and even into Switzerland. Bill slipped in another tourist special when we did our 3 night loop while waiting for Mulvey to arrive, which was to detour east to climb to about the 4,000' level to the village of Macugnaga. From there you can get stunning views of Monte Rosa that sits on the border between Italy and Switzerland. There are group tours from Stresa for $43 but you can put the trip together yourself for about $13 per person using the local train and bus service with a little preplanning the day before, with or without bikes. We liked the views of the mountains and charming villages so much that we did it a second time with Mulvey. The first time we rode up with heavy day loads on our bikes. It was very hot and it took us about 5 hours (including our mandatory picnic lunch) to ride to Borca, just short of Macugnaga. When we did it with Mulvey, we combined a train ride with a bus to get us to the top of the road, a little beyond Macugnaga, on big wheels and then we all took in the views while slowly riding our bikes back down the mountain. 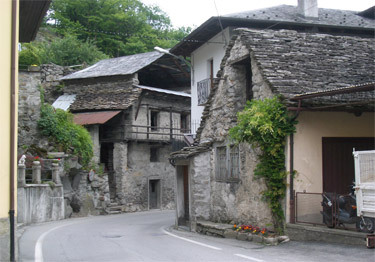 Charming stone village on the road to Macugnaga. Even though the clouds obscured the high mountains on our second trip up, the views were so delicious that it took the 3 of us longer to do the 20 miles downhill than it took Bill and I to do almost the same miles uphill with steep grades. Mulvey's engineer's mind and outdoorsman's heart found more to fascinate him than even Bill and I had found. He took the equivalent of a couple of rolls of film in the process. 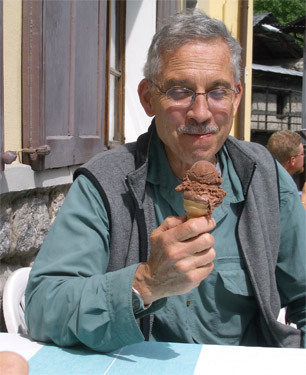 His enthusiasm was a good reminder as to why we are always eager to return to the Alps: its a stunning combination of dramatic geology, lush greenery, intriguing stone and woodwork, old world villages and friendly people--all at reasonable prices. I strongly recommend not driving to Macugnaga yourself. It is a narrow, winding mountain road that dwindles to a single lane too often. There is a driving etiquette about right-of-way that wasn't obvious to me but was important to understand. The driver of our full-sized bus sounded his horn often and all the other vehicles clung to the outside edge of the road to make room for us. If the bus couldn't pass, they were obliged to back up until we could. Almost all of the drivers must have been 'regulars' because they seemed to know where they had to stop to leave enough space for passing. One professional driver was a little too hurried and will be buying the bus company an expensive side view mirror to replace the one he ripped off our bus. If you take the bus up, sit at a window on the driver's side to be convinced as to why you didn't want to drive it. In high season there is a bus directly from Stresa to Macugnaga but I don't know if it takes bikes. Mulvey enjoying a rest stop on the way down. And as you will understand when you read on, I would recommend the route only to confident cyclists. It is a hard climb up and the tunnels have the potential to be dicey. But if you ride it, take headlights and tail lights (which aren't provided on rental bikes) and let your eyes adjust to the darkness before proceeding too far into the tunnels on the downhill trip. 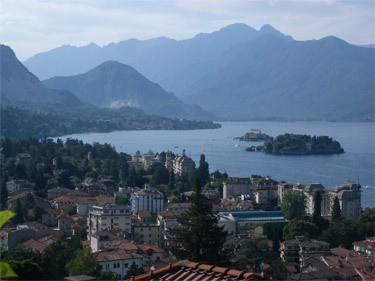 Click on "Country Details" on our homepage, then on "Italy - Northern" (or click on the link here Italy - Northern) for all the particulars to make the train/bus trip up the mountain with bikes as we did the Mulvey plus lodging recommendations and other excursion details for the Stresa area. A couple of tunnels on the road from Piedimulera to Macugnaga in the Lake District added some startling chapters to our lesson book on riding through tunnels on bikes. We strive to avoid tunnels because at their best they are terribly noisy and uninteresting and at their worst, they are frightening and dangerous. So Map Man scrutinizes possible routes to minimize "tunnel time" and once at a tunnel, we always poke around hoping to find an abandoned old road that bypasses the tunnel altogether. Occasionally we are rewarded with small deserted roads with beautiful panoramas or cliff-edge views but most of the time we must hunker down and ride or walk through the carved cavern. Our road up the mountain to the Monte Rosa viewpoint had a half dozen tunnels, though most were non-issues. Several were "galleria's" that are often built for slide or avalanche protection and have pane-less 'windows' along the downhill side, flooding the galleria with daylight. A couple were short or well illuminated tunnels that we were able to ride through without a hitch. Our first tunnel lesson came as quite a shock as it was on our return trip down the hill from our first visit to Macugnaga. Bill and I had easily traversed the tunnel going up hill but shortly into it on the return trip down Bill, who was in the lead, shrieked and stopped in his tracks. He had unexpectedly been blinded by the tunnel's darkness. Since I was following and was a tad closer to the tunnel's entrance, it didn't affect me as severely. We later realized that on the uphill journey we had paused for me to cool off in the shadow of the tunnel by an adjacent waterfall. That had given our eyes time out of the bright sunlight and when we resumed, our slow uphill pace didn't outstrip our eyes' ability to adjust to the darkness. In contrast, on the return trip, we entered the tunnel from a blaze of bright sunlight and were effortless coasting at a good clip, both of which overwhelmed our eyes' ability to function well in the dark. It was also in this tunnel that Bill learned that his headlight batteries needed replacing: the headlight was still kicking out light but not enough to navigate through the darkness with expected ease. Bill quickly shouted that I should make a sharp turn so as to head to the right side of the tunnel as in the sudden curtain of darkness he had lead us out to the center line. As we scuttled on foot to the safety of the tunnel's edge, our eyes caught-up with the change in light level and we were able to slowly ride out of the tunnel though still traumatized by the disorienting effects of sudden blackness. Being the lead rider and in the depths of the darkness, Bill had had a more intense experience with that tunnel. Little did I know that my turn was coming. A few days later when we made only the downhill run on the road with Mulvey on our bikes we warned him of the peril of this tunnel even though Bill installed new batteries in his headlight. As planned, we decorated the 3 of us and our bikes with every blinking and reflective item we had with us. As planned, in a tight formation we rolled into the edge of the darkness and parked ourselves on the curb and waited. We waited until everyone's eyes had switched over to the "Night Vision" setting and then cautiously proceeded. It worked like a charm: we all could see well enough to ride through safely and without a flutter of fear. The surprise came at the bottom of the hill in the longest of the string of tunnels. We remembered that it was long and steep and had left all of our lights blinking so we could roll through it with little hesitation. We paused just long enough to get in tight formation again: Bill with the headlight and a taillight was in the lead position; Mulvey was in the middle as he had only a tiny blinker and strip of reflective fabric clipped on his backpack; and I followed without a headlight but with a taillight, helmet taillight and a small blinker on each arm. Once in line, we headed into the tunnel without apprehension. What Barb saw in the tunnel--nothing. But this time it was I who shrieked: "Slow down. I can't see. Stop.... Help!" Unexpectedly, this long, curving tunnel that had been well illuminated a few days ago was completed black. We hadn't noticed that detail on the bus ride up--we had only noticed that the lane closed for construction that we had had to ourselves the other day was now open to traffic. 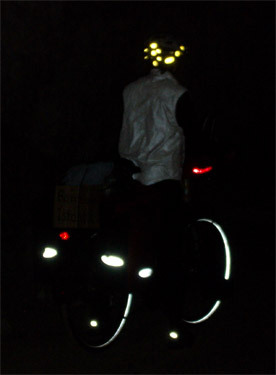 Bill's journey into the darkness was going well with the brightness provided by his new headlight batteries. In the jumble of sensory overload of tunnels he hadn't noticed the overhead lights were out. He heard my first cries of "Slow down" and the best he could reconstruct from my other shouted syllables that became detached by echoes was "Mulvey." So, he slowed down until he was sure that Mulvey was on his wheel and continued on, confident that my concern had been addressed. Literally being 'in the dark', I had slowed and then stopped, instantly knowing that I was a caboose that had been unlinked. I was on my own in the darkness. Fortunately my survival instinct overcame the impulse fed by a crises at the end of a long day, which was to slump down in self pity and cry. Instead, I remembered the terror Bill experienced in the other tunnel only a few days before and more importantly, his solution of quickly scampering to locate the right side edge of the tunnel. Still straddling my bike, I scuffled off in cautious quick steps to my right. In seconds, another wave of terror flooded me as I hadn't found the edge. Not finding it meant that like Bill the other day, the curve of the tunnel and the wall of darkness had landed me out near the centerline. I was terrified that I wouldn't get to the safety of the curb before a car came charging through. I kept scuttling in the darkness hoping to find the safety of the edge in my race with time. I was on my feet instead of in my pedals to prevent dumping over when I contacted the curb. Quite unexpectedly, I fell down anyway. It pitch black. I was down on my right side without even knowing what happened. I struggled up a few inches and was down again: my right bar end shifter had hooked on my pants leg fabric at the thigh and I think my front wheel was snarled with a 2' high post that probably once was a reflector. Hitting the pavement a second time added an unwelcome additional impact to the scuffed and bruised contact points on my body. After several panicked attempts, I was able to free my clothing from the bike enough to get both me and the bike upright. I knew that the bike was still at an odd angle into the traffic lane and I cautiously fumbled in the darkness to orient myself and bike with the curb without going down again. My goal was to be like a bat and cling to the edge of this cave until I could get myself organized. The weight of water and gear in my pannier had made righting the bike in the dark much more difficult and instructed me on how important the visual cuing is to managing that extra weight we always carry. Once standing fully upright with my bike nestled into the curb, I looked back at my taillight. It was my lifeline--it alone would keep me from getting hit by a zooming car. My confidence skyrocketed by seeing it was still in place and still blinking. In my panic I had forgotten my other safety features: my Illuminite vest would glow brightly with the reflected light of headlights, my 6 tiny helmet lights were still blinking madly, and I had small blinkers on each arm. I was now collected enough to proceed. I decided to walk in the piled grit and debris on the pavement at the curb and with each passing car I would step up onto the sidewalk as only with the aid of their headlights could I avoid tripping over the succession of nonreflective reflector posts. I had straddled the bike and hoped to coast in the brief illumination of the passing cars but had visions of being clipped by a car and loosing my left leg. (Being a habitual and strong visualizer has it pluses and minuses.) So I settled on the slower process of walking on the roadbed with the bike to my left and stepping up onto the sidewalk as light permitted. I knew it was a long tunnel and I knew that my plodding pace put us at risk of missing our train into town, but I resigned myself to shuffling out of the darkness at a snail's pace. It was probably only minutes later and the glow that I recognized as Bill's headlight was bouncing off the tunnel's walls ahead of me. I had wondered what he would do when he exited the tunnel and at some point discovered I was missing. When I saw his light on the opposite side, I envisioned him riding back on the wrong side of the road, which added to my worries. Instead, he had the presence of mind to remove his headlight from the bike and he was walking back into the tunnel, which was a much safer though slower approach. Bill of course was horrified that I had gotten dropped in our team ride through the tunnel and was more horrified to hear of my tumble. He had had his full dose of darkness terror a few days earlier and so knew exactly what I had been through. Once out of the tunnel, I was aghast to discover that somewhere in my walk that my taillight had fallen off--the light that I had assumed was the only cue the motorists had about my presence was gone. Bill grabbed tools from his bike to square-up my dislodged bike saddle and made a quick inspection of my bike for rideability and then the 3 of us were off down the hill in hopes of still catching the train. Once on the deserted train station platform, we began a quick clean-up of my scuffs. The sample-sized bottle of shampoo stashed in my handle bar bag for hand washing at public toilets, a tissue and some drinking water were enough for Bill to clean the abrasions on my forearm, "road rash" as it is known in the cycling world. Fortunately my long sleeves and long legged pants kept the road grit out of my roughed up skin and it was largely an issue of diluting the normal superficial bacteria to reduce the risk of infection. Bill was pleased with the look of my wounds; I was pleased to see that my 1-of-2 summer-weight shirts for our 10 month journey was only blood and grime-stained and not torn. Mulvey swapped his lighter-weight rental bike for my heavier touring bike with a pannier for the stairs portion of our journey through the train stations, which relieved the strain on my jangled and jerked body. Barb as the motorist's would have seen her. Bill and I debriefed the tunnel vision event while cleaning up my skin on the platform, for the duration of the 20 minute train ride and off and on for the next several days. It was a similar debriefing after our first tunnel darkness problem that had kept us safe this day: it helped us traverse the tunnel we knew was dark and it loaded my mind with the information I needed to quickly form an action plan when I went down in the unexpected dark tunnel. It was in the process of debriefing that I realized that my peril wasn't as great as I had perceived at the time. Because we strongly believe that it almost always takes more than one thing going wrong to have a disaster, I had 4 different light sources on me, plus my Illuminite vest and odd bits of reflective material on my shoes, helmet, pannier, and tires. I also realized in hindsight that because of all that safety gear, cars would likely have seen me when I was out in the middle and slowed down. Had it been a continuous stream of traffic, the problem wouldn't have existed as I would have had enough light to see. As it was, the traffic was sparse, so any cars could have safely slowed and diverted around me. In our debriefing we of course revisited our strategy of having only 1 headlight. Our policy is to never ride at night and in reality our only night riding abroad has been in well lit cities. We try to avoid tunnels and in our 4+ years of European riding, this is the first time we have encountered tunnels too dark to ride in. The problem with headlights is that we use them so little, it is hard to be motivated to have 2 high quality ones. They are expensive and heavy and literally wear out just living in the elements on the handlebars and one even fell off and was gone forever when going over rough terrain. The batteries run down, switches wear out, and attachment mechanisms get sloppy. And this situation proved our theory true, which is that 2 people can get through a dark tunnel safely on 1 headlight but what we didn't know or expect to need to know is that 3 people can't. So, rather than invest in a second headlight, I will now carry our small Petzel headlamp in with my other tunnel supplies that are in a small bag strapped on my bike frame. That way it will be ready for action in the unlikely event that we are surprised by the darkness of a tunnel again. Mopping up after this misadventure won't be too hard. Earlier on the same day my bike computer mysteriously fell off so it will be replaced along with the missing taillight in the next big town. Bill will easily be able to readjust my slightly catawampus handlebars. He inspects my relatively small patches of shallow road rash daily and reports that there is no sign of infection. I'll need to be extra diligent about being symmetrical for a week or so both on and off the bike while my jangled musclo-skeletal system restabilizes and that should be the end of it. Fortunately I seemed to have left the terror in the tunnel and am only carrying the wisdom of the experience with me. And despite our brief but harrowing experiences, there must be a way to manage in these dark tunnels as we saw plenty of lightly equipped cyclist's on the road that couldn't have had headlights on their bikes. When Bill was into the first dark tunnel letting his eyes adjust, he did witness one "roadie" or racer-type cyclist going through. He said the speeding guy slowed way down, released 1 foot from the pedal mechanism and tapped his way along as a limited-vision person would do with a cane. Clearly he'd done it before. The roadie's probably rode up, noticing that on the longer tunnel that was dark this day and so weren't surprised like we were on the descent. And the more daring among them may wait for a car and speed through with the benefit of its headlights. We lingered in pleasant Stresa a little longer and shared in Mulvey's excitement in planning the next leg of his extended trip. Our pick was taking the 4 hour train ride from Stresa to Venice and after a brief visit in Venice, taking the bus into the heart of the Dolomites region of the Alps to Cortina della Ampezza. Cortina is in a beautiful area with stunning, close-up views of the mountains with some great day trip opportunities to get even higher. It also is a reasonable launching point to Bolzano, another favorite Dolomite city of ours. But our revisit to the Dolomites would have to wait, as first we were detouring northwest to visit Zermatt and the Matterhorn after traversing the scenic but high Simplon Pass. On the way to Switzerland, we'd be picking up a pair of telescoping walking sticks for us to share on day hikes in addition to buying my bike parts. After doing a little hiking in Switzerland, we will work our way east for yet another look at the Dolomites and more hiking there. Next on the itinerary are Nis, Serbia; Sofia, Bulgaria, and then into northeastern Greece and on to Istanbul in early September.